The male bust, cut off at the height of the chest, originally was inserted in a statue. The portrait features an elderly man as suggested by the wrinkles on the forehead, between nose and lips and on the neck, as well as by the flabby face and hollow cheeks. The face is characterized by slanting eyes, hooked nose, tight lips and receding chin. 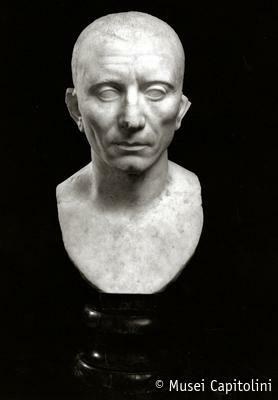 This portrait, datable to the Augustan age (27BC – 14 AD), was acquired for the Capitoline Museum from the collection of the cardinal Alessandro Albani in 1733.